Bruce Boynton is a former lawyer who played a special role in the civil rights movement: He paved the way for the Freedom Riders. This 80-year-old civil rights pioneer helped jump-start a moment in the civil rights movement — thanks to his appetite. He was honored for his contributions in Montgomery, Alabama, on May 18. In 1958, Boynton was arrested for trespassing when he sat in the whites-only section of a restaurant in a segregated bus terminal. 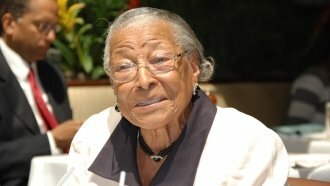 Boynton said in the U.S. Civil Rights Trail documentary: "I knew that it was against the law that the reason I sat down and refused to leave was that I ordered a cheeseburger with tea with cream. And the waitress wrote the order down and Ieft, and I assumed that I was going to be served, since I was in the upper part of the South. Actually, she came back with the manager. The manager took his finger, placed it in my face and said, 'N*****, move.'" Boynton was defended by Thurgood Marshall, and his case went all the way to the Supreme Court. Marshall argued, "There was no dispute that the petitioner was an interstate passenger — as a matter of fact, his ticket was tendered in the Court — and that he not only was an interstate passenger, but he was actually in passage between Washington and Selma, Alabama." The court decided in Boynton's favor, saying racial segregation on public transportation, including bus stations, violated the Interstate Commerce Act. This act broadly prohibits racial discrimination of passengers, and Boynton was a passenger. Justice Hugo Black wrote, "Under such circumstances, an interstate passenger need not inquire into documents of title or contractual arrangements in order to determine whether he has a right to be served without discrimination." Boynton's defiance helped pave the way for civil rights. The landmark case inspired Freedom Riders, black and white students who traveled by bus to the South to test the court's decision. When riders were attacked and a bus burned, President John F. Kennedy ordered stricter enforcement of anti-discrimination laws. Boynton said, "It produced the Freedom Riders … and changed the way black people fought for the civil rights."